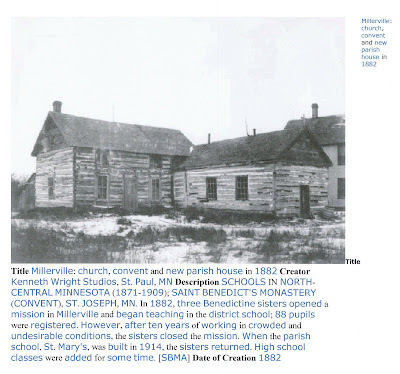 St. Mary's Catholic Church 1882. 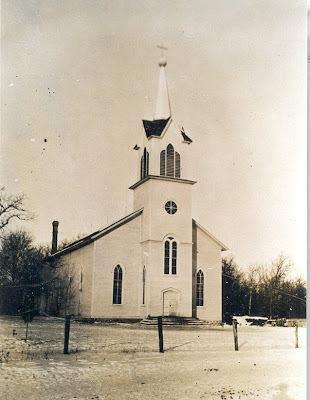 This church stood where the present parish hall stands. 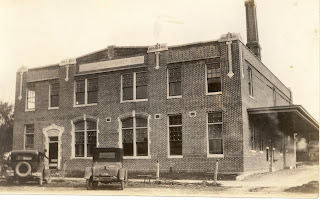 The first creamery was built in 1911 around Front Street E. In 1929 a new creamery was built on the corner of Central Avenue and 2nd Street. 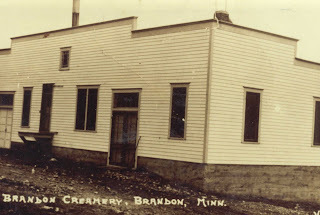 Later parts of the first creamery were torn down and a new building erected where Roy Strom had his scales for weighing livestock. 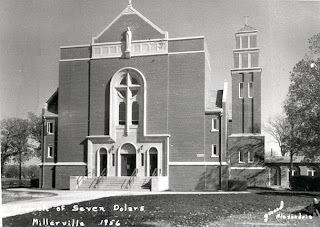 The new creamery was dedicated in October 1929. There were food lockers available for residents to rent. Up-stairs there was a dental office, a beauty shop and apartments. 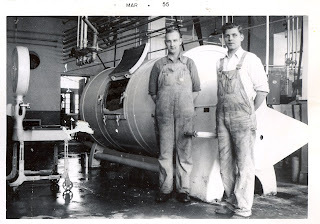 Ed Augdahl & Howard Pederson pictured in the new modern creamery. Between 1929 and the early 1940's the creamery accepted only cream, so farmers did their own separating. In the early 1940's, because of the war, the government needed whole milk, so farmers were no longer required to separate it. 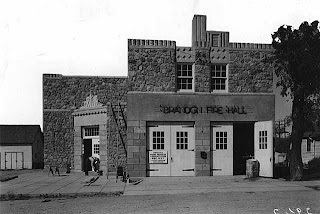 This is a picture of the brand new Brandon Auditorium in 1936. Notice the open door of the new fire barn. Zoom up on the photo and notice the home to the right of the screen and the storage building to the left. A ladder is propped up against the building while a workman is in the front putting on some finishing touches. The sign on the door tells that this is a WPA Project.